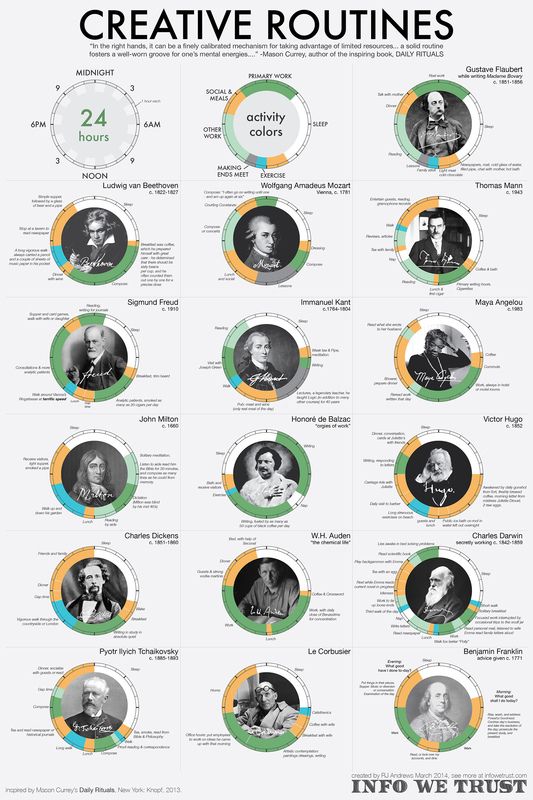 This infographic I found (via Pinterest) compares the daily routines of various historically creative people. Each person has their own circle with their routine circling a photograph of them. Because this is information regarding schedules and time of day, the circles represent a clock. Each type of activity throughout the day is categorized and color coded, and a key is provided for how to read the clock and explains what activity each color corresponds to. Using Tufte’s criteria, this example clearly demonstrates the concept of small multiples. All of the information is within the eye span of the viewer and each piece of information is shown in the same format throughout the graphic – small circular photos of the subject surrounded by a clock-like graph containing the important data. As far as the design of these small multiples and the graphic overall, it fits the criteria fairly well. As stated by Tufte, there is an “effectiveness and elegance of small spots of intense, saturated color for carrying information.” The graphic is mostly black and white with a light gray background, and uses color only for the information being communicated. This makes the important part of the graphic stand out with contrast and states its purpose explicitly. The use of text could use improvement. The sans-serif font is appropriate for the content and design. It is easy to read the larger text in the image. However, there is a lot of smaller text that is not so easy to read. Looking closer, the small pieces of text placed around the circle share a few facts about the person or a particular part of their routine. Although these bits of information are interesting, I don’t think they add to importance of the focus of the graphic. Looking at it from a normal distance, the tiny text becomes distracting blocks that disrupt the streamline look of the entire design. There is framing in between the multiples, but it is made of very thin lines that are a slightly darker gray than the background and does not seem too disruptive. Because the circles are placed on a grid already, I do not think the framing is needed. It is probably there to divide all of the small text and keep it contained with its corresponding information in order to avoid confusion. If that unnecessary text and framing were eliminated, this design would be extremely successful. I'm a graphic design student at Washington State University. My favorite things are art, music, and family.